NHS trusts across England are spending millions of pounds outsourcing staff to new arms-length private companies, says UNISON today (Monday). Using a Freedom of Information (FoI) request, UNISON has revealed that NHS trusts are shelling-out huge amounts of money on consultants. These companies are advising trusts on the setting up of wholly owned subsidiaries, to which staff are then outsourced. UNISON says that these new companies appeal to NHS trusts because they can reduce their VAT payments, and cut the pay and pensions for any new staff recruited. The health workers that are being transferred tend to be the lowest paid within the NHS, such as porters and cleaners. Only 22 out of 31 NHS trusts that UNISON approached complied with the FoI request – published to coincide with the start of its annual health conference – but the amount spent by just 15 of them is already in excess of £3.2 million. Topping the list of high-spenders is Clatterbridge Cancer Centre in Birkenhead, which spent more than £661,000 establishing a wholly owned subsidiary. The Royal Free London NHS Foundation Trust and Gloucestershire Hospitals Foundation Trust have both already spent a minimum of £400,000 setting up subsidiaries. Meanwhile, Airedale NHS Trust in Yorkshire spent an estimated £343,000 outsourcing staff. To put some perspective on the amount spent by some of these trusts, UNISON has found that the £3 million outlaid to date on transferring staff could have paid the annual salary of around 200 extra hospital cleaners*. – * Based on an NHS cleaner currently on band 1 (spine point 2) who is earning an annual salary of £15,404. UNISON believes this is of particular concern with research showing that a lack of cleaners is associated with a greater incidence of MRSA. – ** Salisbury NHS Foundation Trust is involved with three subsidiary companies – Salisbury Trading Ltd (providing linen services in the trust), Sterile Supplies Limited (a joint venture with Steris – formerly Synergy – that provides sterilisation and disinfection services), and Wiltshire Health and Care LLP (formed with the Royal United Hospitals Bath NHS Foundation Trust and Great Western Hospitals NHS Foundation Trust). – The 9 trusts that failed to respond to the FoI request are: Guy’s and St Thomas’s NHS Foundation Trust; Central and North West London NHS Foundation Trust; Northumbria Healthcare NHS Foundation Trust; City Hospitals Sunderland NHS Foundation Trust; Bolton NHS Foundation Trust; University Hospital Southampton NHS Foundation Trust; North Tees and Hartlepool NHS Foundation Trust; the Mid Yorkshire Hospitals NHS Trust; Calderdale and Huddersfield NHS Foundation Trust. – The information on Royal United Hospitals Bath NHS Foundation Trust is freely available on its website and so no FoI was necessary. 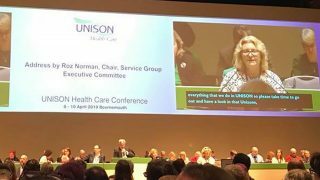 – UNISON’s annual health conference will be held between Monday 16 April and Wednesday 18 April at Brighton Centre, Kings Road BN1 2GR. The event is open to the media. If you would like to attend please email press@unison.co.uk with your name, job title, the media outlet you work for, and a passport-sized photo. 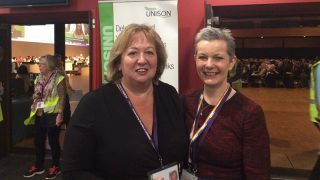 No flash photography is allowed at any UNISON conference or meeting. – UNISON general secretary Dave Prentis will address delegates on Monday morning. Also on the first morning, there’ll be speeches looking ahead to the 70th birthday of the NHS in July from Aneira Thomas, the first baby born in the NHS, and Patrick Vernon, the director of Black Thrive, who’ll speak about the contribution made by the Windrush generation. – Debates at the conference will highlight the problems many healthcare workers face such as abuse and violent assaults, growing workload pressures and the outsourcing of staff to arms-length private companies. The consultation on the NHS pay offer will also be launched at the conference.